Two readers generously offered their valuable insights on the Case-Shiller OFHEO gap I noted earlier this morning. Professor Nunes says that the CS index puts too much weight on particular regions. He has a paper showing how Case-Shiller and OFHEO agree much more region-by-region. It looks like he has an important and very useful point. (I must also confess that he sent me the paper last fall, and I failed to remember his contribution). Does the regional aggregation issue explain whether which series is right about January: OFHEO suggests we hit bottom and CS suggests that we're still going down? (Note: Professor Nunes does not like national (as opposed to regional) analysis of housing, so he may be understandably unwilling to answer). Note that OFHEO said that nearly all regions (the West being a notable exception) increased in January. Sean MacLeod of Metacapital Management emails that "those in the mortgage finance market believe the OFHEO data to be c#$p." He prefers Case-Shiller and a third series, RadarLogic. I am not sure CS is so much better. In particular, CS says that national housing prices almost doubled (relative to construction costs!) during the boom, which seems reasonable for a couple of regions, but a huge exaggeration for most of America. 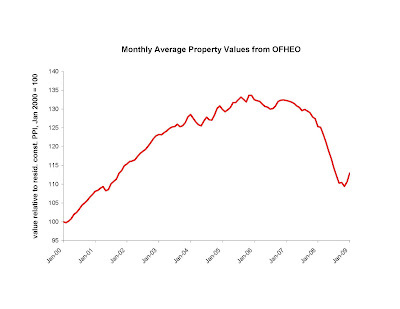 On the other hand, the OFHEO index was late in showing the bust (see the chart below, which measures both relative to the residential construction PPI). That's why I look at both, and support the Employment for Economists Act! Many thanks to Mr. MacLeod and Professor Nunes! Housing prices are an incredibly important economic indicator these days, so their insights are worth many times more what I and the readers of this blog are paying for them! 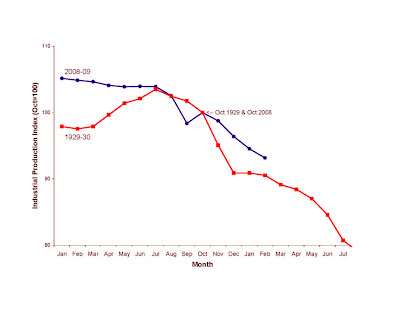 Earlier this month, the OFHEO calculated that housing prices rose significantly from December 2008 to January 2009. Today, S&P reports that its Case-Shiller housing price index fell significantly (close to three percent) over that same time frame! The media reports that consumption spending rose in February for the second straight month, but they are referring to nominal consumption. Real consumption (as well as real personal income) fell. The only good news I see from today's personal income report is that February real consumption is still above the December 2008 lows -- that is, the big January increase was not entirely reversed (alternatively, there was some truth to the January measure). [Last month, somebody asked where to see the BEA releases: go to www.bea.gov and look in the upper right corner]. Will the Geithner-Summers plan solve an ownership externality? Another hypothesis about the banking crisis is that there is an externality -- certain critical institutions harm the wider economy when they hold mortgage assets, but each in its decision to hold them considers only its own costs and benefits. I guess the story is: a bank owner thinks a pool of mortgages is worth $10 million, but owning those mortgages makes the bank excessively cautious, which somehow harms the wider economy. So the wider economy would like to see the mortgages sold to an institution whose caution would be less harmful, even if the less harmful institution valued the pool at just $5 million. But the bank owner refuses to sell for less than $10 million, so the bank owner keeps the pool and its caution. A simple subsidy will not solve the problem. Suppose that the government said that it would pay for $5 million of the purchase price. Then potential buyers whose ownership would be less harmful to the wider economy would be willing to pay $10 million ($5 million for the pool itself and another $5 million for the government subsidy). But the subsidy also increases the valuations of the institutions whose ownership of mortgages is harmful to the wider economy. So if the harmful owners placed the highest value on these assets without the subsidy, they would do the same with it. Nothing about the Geithner-Summers plan gives an incentive to mortgage assets to be ultimately held by the "right" institution. It only gives money to banks and creates a flurry of transactional activity, without changing the real ownership pattern that supposed created the problem to be solved. Will the Geithner-Summers plan solve the Lemons problem? One hypothesis about the banking crisis is that a secondary market for mortgages "does not now exist" (quote from Mr. Geithner's oped introducing the plan) because there is a "lack of clarity about the value of these legacy assets [which makes] it difficult for some financial institutions to raise new private capital on their own." (quote from U.S. Treasury fact sheet). I guess the story is: a bank owner thinks a pool of mortgages is worth $10 million, and therefore refuses to sell for less than that. Potential buyers of that pool think it is worth $5 million, and therefore refuses to buy for more than $5 million. The market does not exist because the sellers value the assets less than potential buyers do. A simple subsidy will not solve the problem. Suppose that the government said that it would pay for $5 million of the purchase price. Then potential buyers would be willing to pay $10 million ($5 million for the pool itself and another $5 million for the government subsidy). The problem is that the bank owner (presumably aware of the subsidy) may not want to sell for less than $15 million. The reason is that he might be able to buy the pool from himself -- in which case he would pay $10 million for the asset (that's what he thinks it is worth) and another $5 million for the subsidy. So if he can sell to himself for $15 million, why should he sell to another buyer who will pay only $10 million? You might say that the Treasury or FDIC would not allow a sham transaction like I just described. Well then you are saying that the Treasury or FDIC will micro manage things -- good luck with that! The Geithner-Summers plan is more complicated than the simple subsidy described above. But my intuition is that even the complicated version misses the point that a subsidy raises every one's valuations of the item subsidized, rather than (as supposed needed) raising the valuations of some relative to the valuation others. Thus, the Geithner-Summers plan looks like giving taxpayer money to banks and creating a flurry of activity without really changing any of the fundamentals (reminiscent of what I wrote last fall about the Paulson plan). Commenters: do you know of anyone who has worked out an explicit lemon's model and then added the Geithner-Summers plan to it? "The Commerce Department says sales rose 4.7 percent in February to a seasonally adjusted annual rate of 337,000 from an upwardly revised January figure of 322,000." This adds to the growing list of reasons why the housing market is turning around in early 2009. Oh yeah, we have to add that building permits increased in February too. "New orders for manufactured durable goods in February increased $5.5 billion or 3.4 percent to $165.6 billion, the U.S. Census Bureau announced today. This increase follows six consecutive monthly decreases, including a 7.3 percent January decrease. Excluding transportation, new orders increased 3.9 percent. Excluding defense, new orders increased 1.7 percent." Eddie Meek points me to this WSJ article, which suggests that, in order to raise housing prices, Green Cards should be given to foreigners who buy a home in the U.S. At its best, the proposal is a Trojan horse for opening the gates to immigration. Edward Glaeser has effectively argued that, thanks to a housing “bubble,” we have too much housing and are better off by adjusting to that reality rather than introducing a subsidy or trying schemes to temporarily and artificially bolster housing demand. On these terms, it might seem that the cards-with-houses proposal is another attempt to avoid taking needed medicine. However, the flip side of “too much housing” is too few people to live in the houses. From some perspectives, America has had, and continues to have, too few people. Skilled immigrants add much to our economy and society. They are often leaders, for example, in patenting and starting businesses. Yet we still severely restrict their entry into the United States. A perennial concern is that our neighborhoods might not be able to absorb many immigrants without some turmoil. But these are not normal times. Many neighborhoods have homes that are in need of occupants, so if there were ever a good time to distribute more green cards, this may be it. However, the cards-with-houses proposal is not just about cards, and therein lie its weaknesses: It proposes to tie the green card to a housing purchase. As a result, the proposal is excessively interventionist and, compared with the simpler alternative of just distributing more green cards, would not achieve its desired effect (raise housing prices). If green cards were sold without housing-purchase conditions, that would bolster housing demand and (in the short run, before additional housing might be built to accommodate the extra demand) therefore prices. The reason is that foreigners working in the United States (that’s the purpose of the green card — to make it easier to work here) need to live somewhere in the United States. Adding a housing purchase condition to green card distribution, and wiping out the old means for obtaining green cards, would not bolster housing demand. It would only reduce the willingness of skilled immigrants to seek a green card. With the extra condition, immigrants would have to either buy a house that they would have purchased anyway (see above), or turn around and rent or sell the housing in the case that they do not really want to own one. Either way, housing demand would be unaffected. As with many well-intentioned policy proposals, the cards-with-houses policy quickly degenerates into government micro-management. The authors of the proposal recognize the resale problem, and think they can “solve” it by having government authorities watch for several years to make sure that the immigrants still own, and do not rent out, the houses they have purchased. But as everyone in New York knows from witnessing (or partaking in) rent control cheating, it is quite difficult to police who lives in which house. The simpler and more efficient alternative is to drop the house-purchase requirement — just distribute more green cards to skilled foreigners — and trust that immigrants have to live somewhere and will thereby bolster housing demand. Cards-for-houses might be politically more feasible because it more explicitly leverages the housing crisis to increase immigration — an increase that would make sense (but lack political support) even without a housing crisis. I cheer for the Greeks in the Iliad, but are Trojan horses a necessary part of our democracy? Acting as if our political system is so dishonest that worthwhile goals can be achieved only by poorly executing ill-advised surrogate ones is not a good way to start someone’s time in the United States. This is so good that I'm posting it twice! Click here to read the commentary. Wells Fargo chairman now explains that without TARP money, his bank would have simply obtained the funds privately. The seasonally OFHEO housing price index increased 1.7 percent from December 2008 to January 2009 (+1.5 percent seasonally unadjusted). So much for yesterday's "Housing prices plunge headline"! I noted the OFHEO housing price index had already stopped falling before the end of 2008. 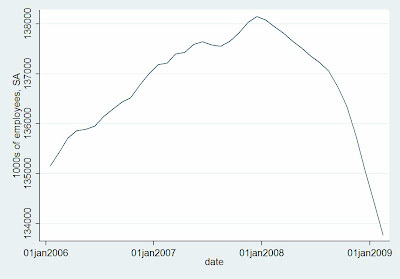 I noted that construction prices were hardly falling any more (see also here). I noted that housing starts made a turnaround in February. 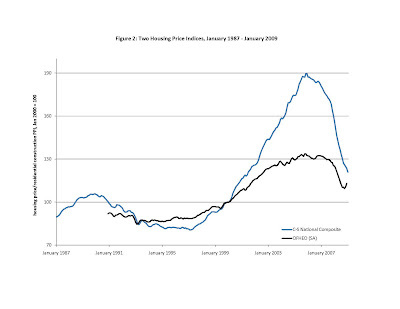 Most important, I noted in 2008 that by summer 2009 population will have caught up with the housing stock. It is helpful to compare the purchase price for a house to the cost of construction, because the higher is the former relative to the latter, the greater the incentive to build more houses. 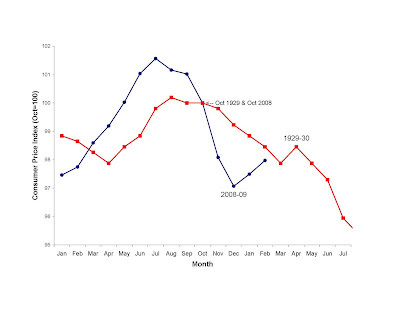 The chart below shows the monthly OFHEO housing price index compared to the PPI for residential construction: January 2009 is above every single month since July 2008! You have to dig to find a headline on this, but here's one from AP "Home prices post 6.3 pct annual decline in January". Notice that the reporter is looking at the same data as shown above, but apparently needs a bad news headline in order to collect his/her paycheck, so that's what you get. Low employment was a tremendous problem during the Great Depression of the 1930s. That problem created an excuse for some shameful and ultimately regretted labor market policies, such as the barring of married women from some jobs. Reminders of this pattern are already starting to be seen in today’s recession: the Employ American Workers Act (a part of the stimulus bill) makes it difficult for companies helped by the federal bailout plan known as TARP to hire skilled immigrants. The “marriage bar” is a discriminatory employment practice that was common years ago, even if it seems unfamiliar today. The marriage bar actually had a couple of versions: a “hire bar” in which a woman would not be hired if she were married, and a “retain bar” in which single female employees were fired when they married. Professor Claudia Goldin’s book “Understanding the Gender Gap” explains some of the historical evidence showing that marriage bars proliferated during the Great Depression. National Education Association surveys indicate that, as of 1928 (just before the Depression), 61 percent of school districts had a hire bar, and 52 percent had a retain bar. By 1942 (after the Depression), the percentages had increased to 87 and 70. Two office firm surveys indicate that school districts were not alone in putting these policies in place, and that the 1930s was a time of significant increase in their practice. Today it is difficult to fully understand the historical origins of these practices, but we strongly suspect that “saving jobs” served as an excuse, especially during a time of low employment like the 1930s, because jobs were portrayed as a zero-sum game. A job held by a married woman, so the story goes, takes away a job from a head of household (that is, a man, or perhaps a single woman). Supposedly these bars would create jobs for heads of households. The Census Bureau has measured the employment situation every year since the 1960s. 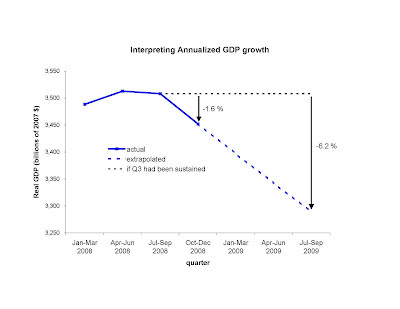 The chart below uses that data to show how the “zero sum” theory was refuted by the subsequent history. Among people aged 25-54 (25-54 are prime ages for working, before retirements of some cohort members) in 1967, 14 percent were women working full-time jobs throughout the year and 39 percent were men working full-time jobs throughout the year (the remaining 47 percent were men and women not working). By the year 2006, 26 percent of people in that age group were women with full-time jobs throughout the year. According to the “zero sum” theory, male employment should have fallen to 27 percent of the people in that age group — each woman hired would represent a man not hired. 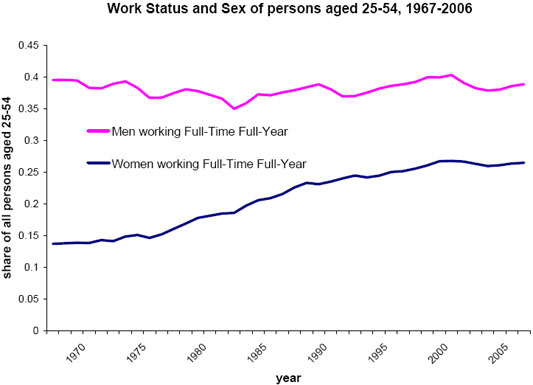 In fact, by 2006 men working full time throughout the year were still 39 percent of people aged 25-54. That is, the labor market was able to absorb millions of women workers without losing jobs for men. Thankfully, marriage bars are recognized today to be both politically and economically incorrect. But the “zero sum” theory still thrives in political rhetoric, as in “Take This Job and Ship It,” a book by Senator Byron L. Dorgan, which claims that every job created for our trading partners is one less job for Americans. And as mentioned earlier, the theory has even found its way into the stimulus bill, now to oppose the hiring of skilled foreign-born workers. Perhaps that hiring might harm particular groups in the short run, but economics recognizes that on the whole international trade and migration create opportunities for Americans. Given that I thought that housing would likely hit bottom early in 2009, I have been watching the latest housing numbers. Today it was reported that February existing home sales and prices were both higher than in January. Interestingly, the media was honest that sales were higher than in January, but put "prices plunged" in their headline. In fact (seasonally unadjusted) prices rose from January to February. The "plunge" refers to the change from February 2008 to February 2009, which is not news at all (everybody knows that prices fell month after month during 2008). Note that the average home prices (seasonally adjusted) increased Jan-Feb in all four regions. Seasonally adjusted home sales did too. [Technical note: seasonally adjusted prices are not available from this source. Arguably, seasonal adjustments for the prices are not needed because they would be minor. No reasonable seasonable adjustment would conclude that prices "plunged" Jan-Feb]. 11 percent of global skyscraper construction has been halted. I think that means that 89 percent continues. In the U.S., it's 10 percent halted and 90 percent continuing. In Chicago, delinquency rates on construction loans were 15 percent in 2008 Q4. To me, these results show no sign of a credit crunch. First of all, recall that construction requires ongoing credit, so that a credit crunch -- if it existed -- should be readily visible in skyscraper construction. Second, note that some of the planned skyscrapers were residential, such as the halted "Chicago Spire." Given the realization circa 2007 that we have too much residential housing, much residential construction should have been halted even without a credit crunch. From this perspective, it is remarkable that 90 percent of skyscrapers continue to go up. I have been watching four of them (three residential and one commercial) out my window since last summer. U.S. Bancorp took $6.6 billion in TARP funds in 2008. At the same time, they maintained their dividend (continuing a 75 year tradition of maintaining or raising it). This month they announced that they would give the TARP money back to the Treasury. How will they replace it? But cutting their dividend for the first time in at least 75 years! It is not a coincidence that U.S. Bancorp cut its dividend at the same time that they repaid the TARP money. I explained last fall how Treasury "capital injections" just result in greater payments to bank industry shareholders. One (of many ways) it could work is that a bank that had become less profitable during this recession would either cut its dividend in the absence of Treasury funds, or (as with TARP recipients like U.S. Bancorp) use the Treasury funds to maintain the dividend it had prior to the recession. The same argument implies that payments from a bank TO the Treasury would reduce payments to bank industry shareholders. That's what we see with U.S. Bancorp. The CPI and PPI both increased in February, for the second month in a row. That may break a pattern that, prior to February, was all too similar to 1929-30. The chart below displays the (seasonally unadjusted) CPI for 2008-9 and 1929-30. The high school basketball team from Greenport, N.Y., is headed to the final four of the New York state championship this weekend. Their journey illustrates a key ingredient in American economic growth over the years, and how bad public policy could spoil the recipe. Greenport is a small town near the end of Long Island’s North Fork, about 100 miles from New York City. Its small high school serves the town and neighboring villages, graduating about 50 men and women each year. Athletes at such a small school rarely specialize. For those schools to field even a small variety of teams – basketball, football, baseball, etc. – many athletes may play multiple sports. But in high school, as in life, those who do not specialize in one task are unlikely to be as productive as those who do, even while those who undertake multiple tasks may find the variety in their work to be more enjoyable. The advantages and disadvantages of specialization in the adult world are readily seen in the medical field. Research has shown, and pay scales confirm, that highly specialized medical doctors are more productive – make better diagnoses and fewer mistakes – than do general internists and general practitioners. Yet every year many talented new medical school graduates choose to become general internists and general practitioners – and thereby receive less pay than that available from specialties – because they enjoy the variety of patients and situations to, say, performing the same surgery over and over again. And some of them may want to live in small towns like Greenport, N.Y., that do not have enough people to keep a specialist busy. Some people think that members of the adult work force seek to maximize their incomes, and on this basis conclude that income taxes do not affect worker behavior. After all, they claim, maximizing all of your income is the same as maximizing half of your income, so what decision-making difference does it make whether the government takes half? Taxes and regulation do make a difference in these kinds of choices, because workers do not simply maximize their income. Like the medical school graduates and Greenport High School athletes, people everywhere consider giving up some income and productivity in order to live a fuller life in some other way. They choose the more specialized career path when the extra income or production more than offsets the amenities of being less specialized. Income taxes take no part of the joy from having a variety of work tasks, living in a small town, and many of the other amenities that come from the less specialized career path. Income taxes do take part of workers’ incomes, and therefore part of the reward of the more specialized career path. The higher the income tax rate, the more likely people are to look at the less specialized option. The Greenport High School Porters consider the costs and benefits of specialization, too. One thing that makes this year’s team successful is that members have been focused on basketball. Although basketball is formally a winter sport, many of the Porters forgo other pastimes all year round. Among other things, many of the Porters take part in off-season basketball leagues, even in the summer, when Greenport offers great fishing, boating, etc. The result for Greenport High School has been victories over schools many times its size, and maybe a state championship this weekend. In Greenport, as in the rest of the economy, productivity and success are made from effort and specialization. read it here. Yet another recognition that people with low incomes will get a better deal from their mortgage lender. Last month I floated the idea that the housing market had hit its bottom. The two things I saw were: a December increase in housing prices as measured by the OFHEO, and a January decrease in the PPI for residential construction that was a lot less than it had been in prior months. I noted that, lacking any additional data, these could be "aberrations." Today I see two more data releases that add to the likelihood of this possibility: the PPI for residential construction fell even less in February, and housing starts increased in February for the first time since June 2008. The increase was across-the-board: seasonally adjusted and unadjusted, both single family and multi-family homes, and all regions except the West. More boldly I said in December that I "expect to see housing construction resume next summer, if not earlier." I am sticking to that prediction. 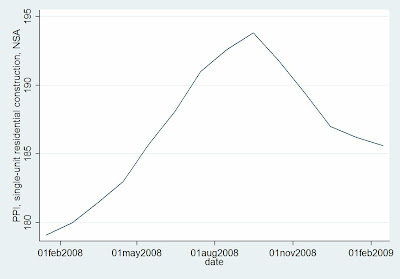 The chart below shows why I think the construction PPI has been evolving differently so far in 2009. The 1930s were different from today in many ways. But its hard to see those differences in this chart of monthly industrial production. Industry is a smaller share of our economy now than then. I have pointed out that, as of January, payroll spending has hardly fallen, despite the four percent drop in the number of persons on payrolls. That is, those who kept their jobs are still getting paid well. Yesterday the U.S. Treasury reported payroll tax collections for February. As with most of the previous months, those collections exceed what they were in the previous year -- see the chart below. Thus, I do not expect much (if any) of a reduction in payroll spending in February. This is good news if you keep your job. 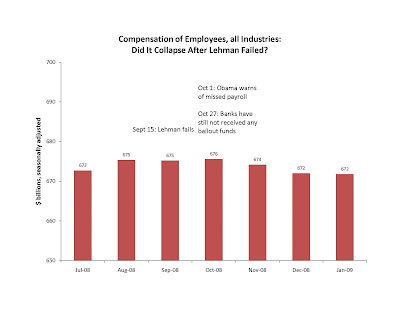 This is bad news if you think high employee pay encourages employers to fire people. 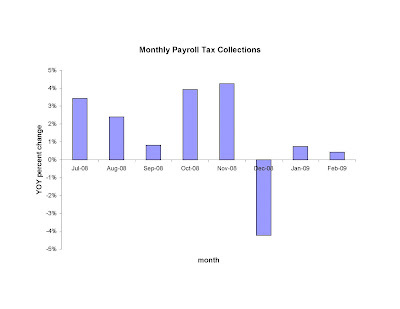 [technical note: tax collections are highly seasonal, so my chart shows each month as compared to the same month in the previous year]. Why Are Delinquencies So Common? Employment has fallen 3 percent so far in this recession (about 4 million). Full time employment has fallen 5 percent. Thanks to unemployment compensation, high rates of pay for many of those who still have jobs, and last year's increase in social security benefits, real disposable personal incomes have been rising for the last six months. Yet 12 percent of households with mortgages are late on their mortgage payments. Just yesterday I read how, in a Catholic high school near Chicago, 20 percent (sic) of the students were taken out of class because they were delinquent on their tuition payments [employment in the Chicago area has fallen about the same -- a bit less -- than it has in the nation]. The press account of delinquencies is that people lost their jobs. But the arithmetic doesn't add up. Either the official statistics on job loss are way too low, or most of the delinquencies are by people who kept their jobs. Why would so many people who kept their jobs be delinquent? But why pay the Catholic school tuition late (and likely other bills too)? Were a lot of people using home equity to pay high school tuition? I am dubious of that explanation, because the home equity was already gone when school started last fall. 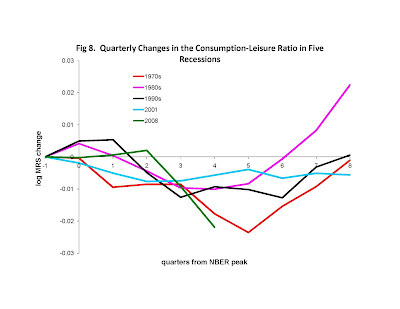 The Consumption Decline: Recognition or Necessity? The amount of disposable income that Americans have had available to spend has continued to increase since last August, while the amount they have actually spent has been dropping. This suggests that the fundamental cause of low consumption spending is consumers’ recognition that their homes and businesses are worth less. It also suggests that consumer spending may be headed even lower. The chart below graphs monthly personal disposable income and consumption expenditure since July 2008, both adjusted for inflation. The former has been rising since August and the latter falling most of the months since June. 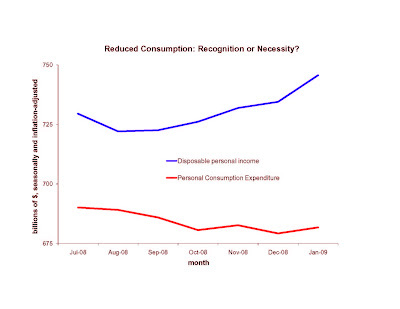 Personal consumption expenditure measures the amount spent by households on goods and services. It comprises about 70 percent of total spending in the economy. 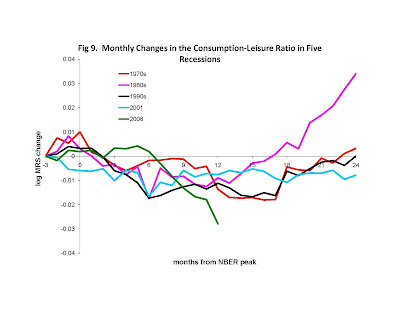 Thus, it is important to understand why consumption spending has fallen so much in the last six months. Personal disposable income measures the income that households actually receive (net of taxes) from their jobs, from dividends and net interest on investments, and from government transfers like Social Security. It is income households have available to spend or save. If severe enough, reductions in personal income would require households to spend less on goods and services. But for several reasons, personal income has actually been rising despite the recession: Millions of people (so far) remain employed and paid well; corporations with slack earnings continue to pay their dividend; unemployment insurance payments have been rising; and Social Security payments were increased. 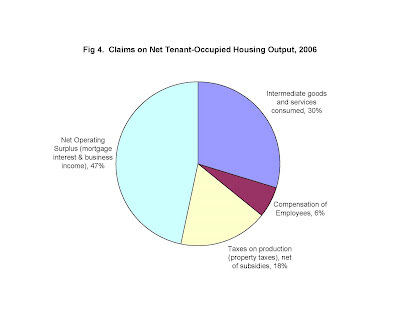 Many people have reduced their purchases of goods and services in spite of rising disposable incomes because they recognize that their homes are worth less, any shares of a business they own are worth less (despite the business’s continued dividend), and those still employed are concerned that they may be part of the next layoff. The year 2008 finished with a lot of bad news that legitimized these concerns. But even with such a modest starting point, 2009 has had plenty of bad news of its own, including a 20 percent (or more) stock market decline and a further sharp reduction in employer payrolls. It seems that consumers could legitimately cut their spending yet again in February, March and April. I agree, although I would replace "a theoretical justification" with "an alluring justification"
Roubini and I both say "Rather than go through mortgages one by one, ... [mortgage] reduction has to be 'across the board...break every mortgage contract.'" (quote from here). I am not sure of what is Roubini's reason, but my view is the heavy damage is created by distinguishing among mortgages -- everybody attempts to get theirs in the favor category -- avoided by treating all mortgages the same. Our house is 97 years old. It is but one of millions of examples of houses that outlive the persons who built them. Of course, its good to have something durable. But my point is that such an extremely durable asset will use resources well beyond the construction phase -- effort will be needed to ensure that a house is adequately used. Often the person building a house will build it to suit their purpose, but that person's life circumstances will change and it will be time to find another occupant for the house, get them financing, etc. Economists often say that the value of a house is the present value of the flows of shelter, convenience, privacy, etc., that the house provides to its occupants. That is incorrect, because you have to subtract off the costs of finding the right occupants and putting them in place! The pie graph below, from my "The Housing Cycle and Prospects for Technical Progress" (read a non-technical version here; the technical version is forthcoming) shows that the subtraction is not trivial. The owner of a house gets less than half of the flows of shelter, convenience, privacy, etc., that the house provides to its occupants. This simple fact reveals an important factor driving the housing boom and bust of the 2000s. reports the IHT. The first bank bailout was needless. If enough Senators recognize that a second bank bailout would also be needless, then we taxpayers may be lucky enough to stop at one bank bailout. I believe that both of the Senators in the report voted for the first bank bailout. So maybe more politicians are adopting the opinion that bank bailouts waste tax dollars. Last fall I predicted that nonfarm payroll employment would not drop below 134 million. As you can see below, the employment prediction was wrong. Another key prediction -- that real GDP would stay above $11 trillion -- is still correct by a wide margin. This prediction will probably hold true, but the bad productivity data lately make me worry that I might someday be wrong on this one. If and when GDP is below $11 trillion and employment is below 134 million, I call that a "severe" recession -- at least as bad as those in the 1970s and 1980s. Now it is reported that more than 5 million homeowners are delinquent on their mortgage payments. How many of them do you think realize that working will only cost them? As long as productivity continues to advance, this recession can remain mild or mediocre. That's why the BLS release today (drastically revising its earlier estimates) is discouraging. It reported that productivity declined slightly. 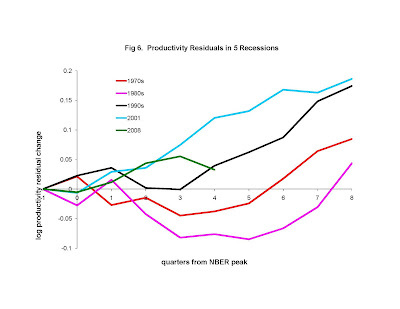 The chart below (Fig 5 from my NBER working paper, revised with the new BLS data) compares productivity in this recession with previous ones. For the first three quarters, productivity was rising, making it quite unlike the 1970s and 1980s recession, and quite unlike the Great Depression of the 1930s. In this situation, a slight decline is bad news because productivity ought to rise when employment falls. This is why I calculate a "productivity residual" -- what productivity would be if labor usage had been constant. The chart below (Fig 6 from my NBER working paper, revised with the new BLS data). 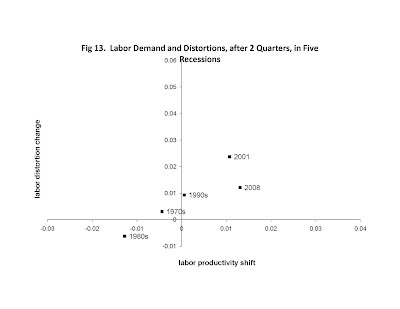 The productivity residual change 2008 Q3-Q4 looks a lot like the 1970s and 1980s recession. If the Q3-Q4 changes continue, this recession will look like no other since the 1930s in that both productivity and labor supply/labor distortions would be getting worse at the same time. The BEA and BLS have revised the numbers that went into my NBER wp 14729, so I paste below versions of that paper's charts that reflect the latest numbers. 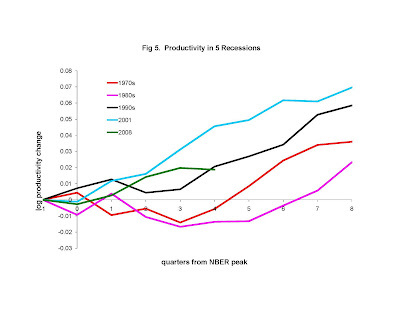 Table 1's row of that paper needs to be revised to show +0.010 productivity residual change and +0.041 labor distortion change (previous estimates were +0.019 and 0.049, respectively). 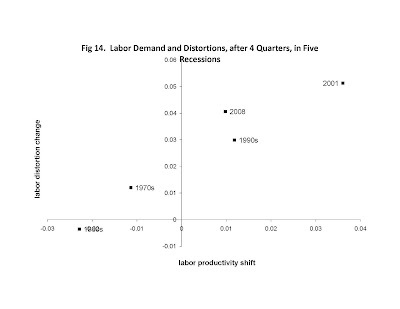 It still looks like "labor distortions" explain the majority of Q4's employment decline, but now it looks an adverse "productivity shock" was pushing labor in the same direction. 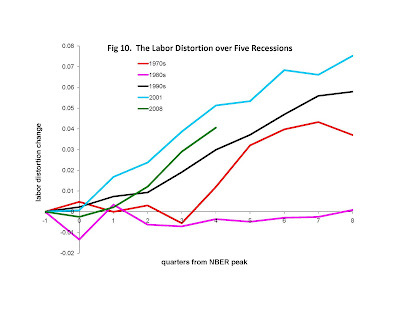 Thus, if the Q3-Q4 changes persist, a lot (likely most) of this recession can be blamed on labor distortions, but (unlike the 2001 recession) some of the blame may have to be shared with adverse productivity growth. I have been the most aggressive as to estimating the number of people who could have their mortgages modified, in November estimating roughly 1,000,0000. Now the Obama administration says that as many as 9,000,000 households may have their mortgages modified. In addition, it was reported today that one in five home mortgages are under water. Last fall, it was thought to be one in ten or one in twelve. I do not see how employment can get much better this year if the Obama administration is going to magnify the problem. Professor Barro uses historical data on stock market crashes and depressions to predict the probability of a depression. I agree with him that the stock market is relevant. In particular, the stock market drop of 2009 (sic) is particularly concerning to me in terms of what it anticipates in terms of economic growth going forward. Professor Barro treats all stock market changes the same (more specifically, he assumes that the fundamentals driving the current crash are equal to the average of the fundamentals driving historical crashes). Given that we know some of the details of this recession, I don't think economic theory justifies his assumption. 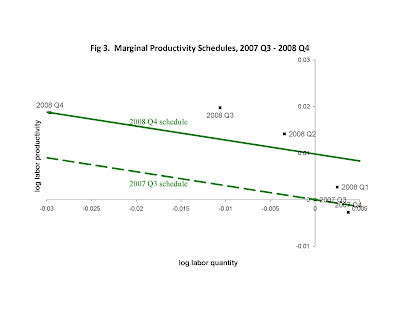 Some shocks, such as productivity shocks, should lower both economic growth and stock prices. However, other shocks push economic growth and the stock market it opposite directions. One of those shocks is an increase in the supply of business investment, which I think is highly relevant in today's recession due to the fact that it began with the end of a housing boom that was competing so hard with business investment. For this reason, the crash of 2008 did not bother me. 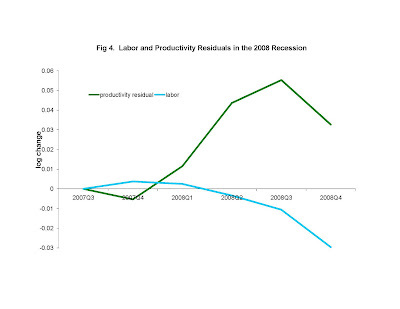 The crash of 2009 is more worrisome, because it could well anticipate poor productivity in the future. 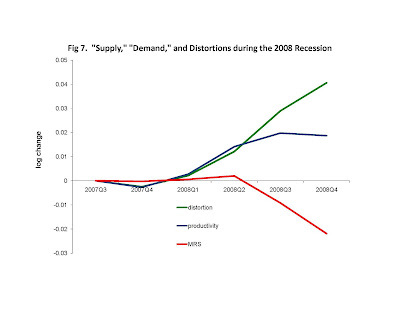 So far productivity has been good in this recession, but 2009's stock market could well see that changing. There is a third possibility: the 2009 crash is due to a shock like the anticipation of a dividend tax that directly harms stockholders but may have little effect on economic growth. I guess that's bad news itself: we would hope for option three! Citigroup announced its Homeowner Unemployment Assist program. Yet another reason why work pays less these days. The Dept of Commerce says that (seasonally adjusted) NONRESIDENTIAL construction spending declined more in January than it did in the entire fourth quarter. the stock of nonresidential buildings in place is already pretty low, thanks to the housing boom. We can do without housing construction for a while, but not without nonresidential building UNLESS our economy is due to shrink. it reflects the onset of a credit crunch. At the end of September, both Democrat and Republican politicans tried to scare us into believing that payroll spending would collapse. The chart below (including the BEA's release this morning) shows that payroll spending has barely hiccuped, let alone collapsed, in the four months since those alarms were issued. Although something is clearly awry in this economy, it is hard to show that a credit crunch is that important, given that trillions of dollars continue to flow from business to households in the form of wages and other personal income items. Regardless of whether you measure it real or nominal, per capita or aggregate. January real personal income per capita was higher than in any month in U.S. history, with the exception of May 2008. This is the second time in three months that real consumption spending has increased. Even bigger news: the news media is actually reporting on this not-so-terrible data.